As pretty as it looks in photos.. it’s a pretty big let down the second you get one in your hands. Plastic, plastic, plastic.. everything about this mod is plastic. Every inch of the mod is made of plastic other than the 510 (even then part of the 510 is plastic, we’ll get into that later). Sure all that plastic makes for a very light weight mod. But it’s definitely not the smallest mod either. The internals are nicely designed and everything is hidden nicely behind more plastic compartments. The rounded edges and slightly convex door panels do give a comfortable feel in the hand. The buttons are nice and clicky and function very well every time. As cool as the 6 door finishes are they all seem to lack finishing details in the edges. This become a glaring issue at the squonk hole, smoothing and finishing with something complimentary in colour to the door would go a long way to adding more flair and style for sure. The OLED screen is a huge plus, not only does it help with power consumption but it is very legible in every light condition. Overall the design is nice aesthetically, the choice in materials could be better even at the cost of an overall price increase. A reduction in size by even 10% would also pay dividends. The Chipset seems to function well and is rather accurate. All the temp features you could possibly want are available and the nicest feature is upon add an new atty with a fresh build the chipset ask if it is new or old and then sets a suggested power setting. This is something Vaporesso has played with but it looks like other chips are starting to play with this too (nice to see). 100W of power with a max of 9V is lots of power to play with and a 0.06ohm min resistance makes for a lot of possibilities and styles of vaping. Battery consumption seems good. It’s always hard to say, we vape in around 0.3-0.5ohms pretty heavy and got about 1/2-2/3 of day per battery charge. The mini usb port on the mod will also charge your battery if need be. The 3 battery size compatibility is also a nice feature, a positive end adapter sleeve is also included for 18650 batteries. One of the biggest issues with the Anita is the 510. With a couple of big players (SVA & ModMakers) making the best squonk 510s on the market we wish we saw more adoption of them in mass produced squonk mods. But Arctic Dolphin decided to make their own and it’s not good. First off the placement of the bottom squonk tube or inlet is not centred over the bottle so there is a bit of a kink or bend in the tube leading from the bottle to the 510. But still worse is the design of the spring loaded mechanism in the 510. It has a major design flaw. The bottom that holds the spring and positive pin in place is not threaded and made of plastic (peek maybe). What happens because of this is attys with longer 510 posts/threads or even squonk refill bottles can put enough pressure to pop the bottom of the 510 out causing loss of connection (and a juice mess internally). Basically you need to take the whole mod apart to snap the bottom of the 510 back in (and clean things up). Having to be delicate with your 510 and not trusting if it will fail or not while out and away from tools makes this a major deal breaker for us. It’s just a plain and simple horribly designed 510. All squonkers/vapers use refill bottles once you get really into it (convenience), and this 510 just won’t stand up to refill bottles for long (we only trailed this mod for a matter of a week or two). The Squonk action isn’t great with the stock bottle. It’s great that Arctic went with silicon but is just too soft, so soft that getting the top off the bottle can be a major task. We had to use a combination of needle nose pliers and the rubberized handles of a manual rivet gun to pry off the top for the first time. Sure after that it gets easier, but we suggest dropping this bottle all together and getting something better (we have listed some below that would do the trick). Another downer, only 1 bottle is include with the Anita, come on! Almost all squonkers with the exception of higher end stuff comes with at least one spare. Arctic Dolphin may have been onto something with the Anita but in the end a lot of corners were cut that where more than just the nice smooth edges of the mod. A metal body, better 510, cleaner finishing, smaller footprint & better squonk bottles would have made this a great squonker. The idea was great, the execution just not so much. At $45 it’s cheap, but in this case you get what you pay for. 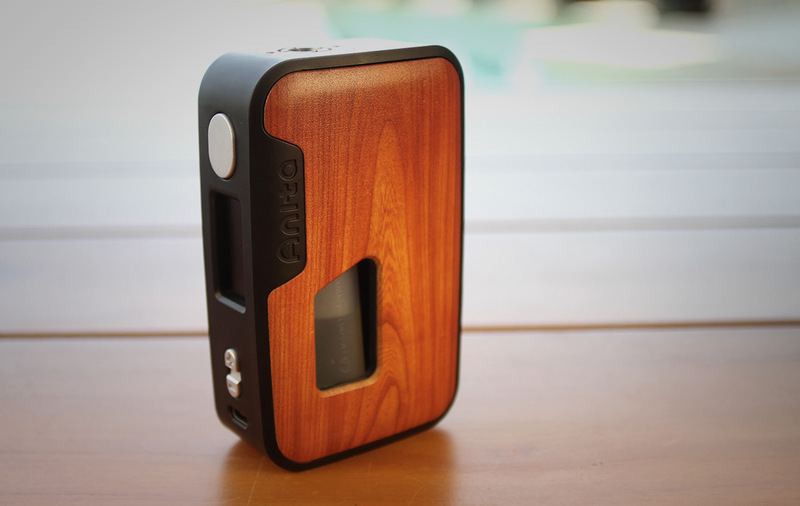 That chipset and screen are pretty dope though, who nows maybe they will use it in another squonker down the road.